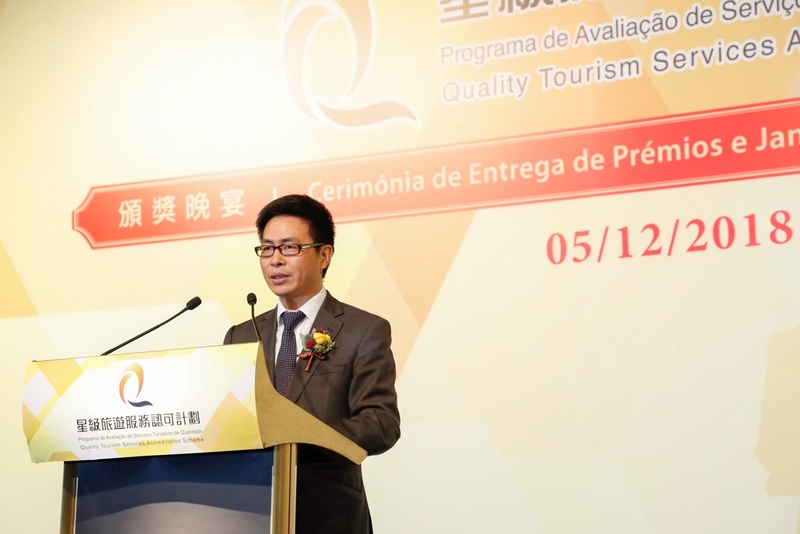 Macao Government Tourism Office (MGTO) once again rolled out the “Quality Tourism Services Accreditation Scheme” (“QTSAS” or the “Scheme”) for the catering sector and travel agencies this year, and hosted the QTSAS Awards Gala Dinner tonight (5 December) to present awards to the winners. Since its launch in 2014, a total of 260 catering businesses and 36 travel agencies have been presented the “Star Merchant Award” including winners of the year. Different personages attended the Gala Dinner including Secretary for Social Affairs and Culture of the Macao Special Administrative Region Government, Alexis Tam; Chief of Office of the Secretary for Social Affairs and Culture, Ip Peng Kin; MGTO Acting Director Cheng Wai Tong and Deputy Director Ricky Hoi; Head of Department of Environment, Hygiene and Licensing of Civic and Municipal Affairs Bureau, Fong Vai Seng; Director of Consumer Arbitration Centre of Consumer Council, Ao Weng Tong; Coordinator for Hotel Management and Tourism Event Management Programmes, Tourism College of the Institute for Tourism Studies, Connie Loi; President of the United Association of Food and Beverage Merchants of Macao, Chan Chak Mo; President of Supervisory Board of Macau Hotel Association, Noel Wong; President of the Board of Directors of Association of Macau Small and Medium Enterprises of Catering, Vincent Ieong; President of Macau Travel Agency Association, Shiga Kunio; Director of Travel Industry Council of Macau, Paul Wong; President of the Association of Macau Tourist Agents, Li Zhizhong, and Chief Executive Officer of Hong Kong Quality Assurance Agency, Michael P. H. Lam, among others. During the Dinner, MGTO Acting Director Cheng Wai Tong remarked that MGTO will work towards the goal of transforming Macao into a city radiant with creativity, and tap into innovative technology to enhance Macao’s image as a Creative City. Furthermore, the Office will keep pushing forward smart tourism development and widening the diversity of cultural tourism products, besides making unyielding efforts to build the Guangdong-Hong Kong-Macao Greater Bay Area as one travel destination and create a Greater Bay Area travel brand. He added that Macao is keenly participating in the Country’s Belt and Road Initiative and the Greater Bay Area development. Also with the inauguration of the Hong Kong-Zhuhai-Macao Bridge, a new horizon of opportunities and challenges has unfolded for Macao’s tourism industry. Concerns have arisen about human resources and tourism service quality. Attaching great importance to cultivation of tourism industry professionals and the demand of training, MGTO strives to deliver Macao’s strengths in tourism education and training, supporting the endeavors to build Macao into a tourism education and training base in the Greater Bay Area. In accordance with the social prospect and market demand, MGTO provides professional and opportune tourism training while encouraging industry professionals to fight for international accreditations and accolades, enhance service quality continuously, tap into development opportunities and rise up to new challenges. He pointed out that the SAR Government is dedicated to preservation of local gastronomic culture and bolstering small and medium-sized enterprises to upgrade and shift into new models. The efforts are made for Macao to radiate a greater influence as a UNESCO Creative City of Gastronomy and enrich the new diversity of local businesses. MGTO encourages members of the tourism, catering, cultural and creative industries to join hands in partnership, leading to cooperation across the field of gastronomy and others, and augmenting the diversity Macao has to offer as a Creative City of Gastronomy. MGTO launched QTSAS in 2014 with the objectives to establish service quality standards for members of the tourism industry as well as support and encourage them to upgrade their service quality. The Scheme also aims to recognize tourism businesses for their outstanding services and excellent service management. The Scheme has gained wide recognition and satisfactory results among the trade since launched. 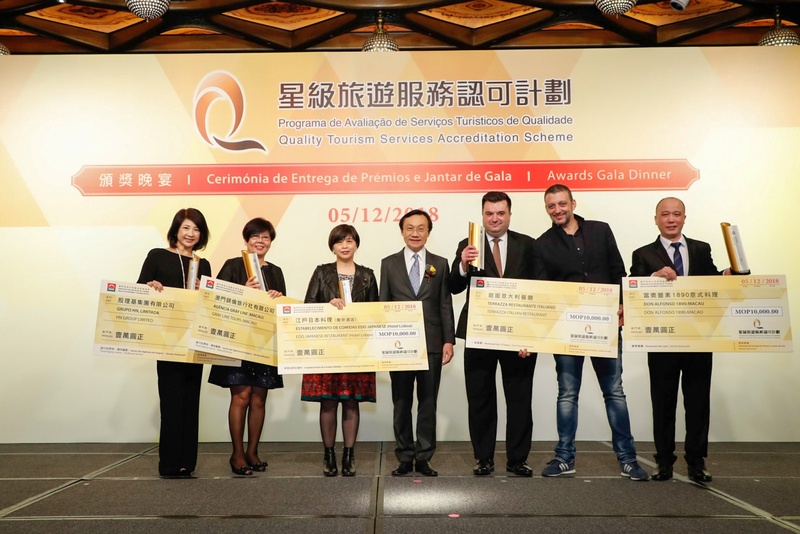 QTSAS presents two accolades namely “Star Merchant Award” and “Service Star Award”, targeting the catering industry and travel agencies at present. For the catering industry, MGTO set up four categories including “Deluxe Restaurant”, “First Class Restaurant”, “Second Class Restaurant” and “Food and Beverage Establishments” based on license categorization. Participating catering businesses were given two types of assessments namely “Mystery Shopping Assessment” and “Service Management System Audit” with regard to their frontline service quality and service management level. For the sector of travel agencies, participating businesses had to go through “Traveller Satisfaction Survey” besides the two aforementioned assessments. 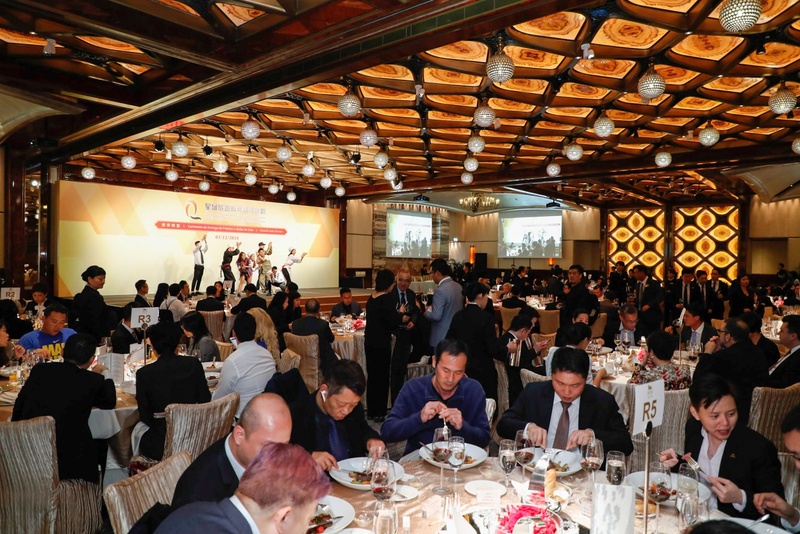 In 2018, 85 qualified catering merchants were presented the “Star Merchant Award” while three of them were also presented the “Service Star Award” for receiving the highest score in their respective categories and a total score not lower than 90. In addition, a total of 9 qualified travel agencies were presented the “Star Merchant Award”. Moreover, to commend travel agencies which provided their patrons with high-quality services in and beyond Macao, the Office conferred the “Service Star Award – Inbound Service” and “Service Star Award – Outbound Service” to the two “Star Merchant” travel agencies which met the prescribed standard and received the highest total score for “Inbound Service” and “Outbound Service” respectively. Each award-winning merchant was presented a “Star Merchant Award” accreditation certificate. Valid for a year, the certificate is for display at their business outlets. Each merchant who won the “Service Star Award” as well was presented a trophy and a cash prize of 10,000 patacas. Since QTSAS was launched, MGTO has held an array of highly-participated training courses and professional accreditation courses targeting the demand of participating and award-winning merchants, supporting them to keep enhancing their service quality. In addition, MGTO has kept promoting the Scheme via different channels and has produced brochures with lists of award-winning merchants, including the “Star Merchant Award – Restaurants and Eateries Guide” and “Star Merchant Award – Travel Agency Industry” for distribution at various Tourist Information counters. The public are also welcome to browse the lists of award-winning merchants on MGTO’s website: www.macaotourism.gov.mo. MGTO will continue to roll out QTSAS and optimize the current system of assessment and incentive for the catering and travel agency sectors. 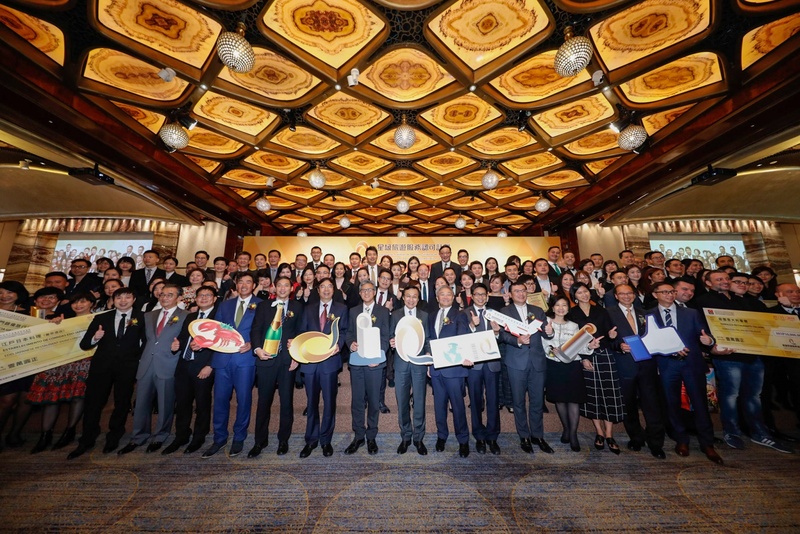 In addition, the Office will continue to organize training programs, workshops and seminars for tourism and related businesses in order to foster improvement in overall tourism quality and push forward quality tourism service, in line with Macao’s vision to become a world centre of tourism and leisure.